QuickGPS stopped working on my HTC Touch Cruise a few days ago. Each time I would try to update it, I'd get some sort of connection failure. I did a bit of research and found out that I'm not the only one with the problem. I tried every hack found on xda-developers to no avail; nothing worked. 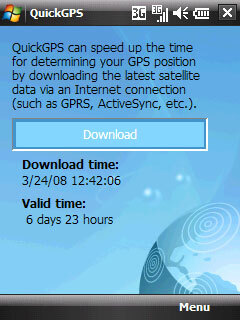 Without QuickGPS it can take up to 4 or 5 minutes to get a GPS fix. Quite annoying. I pretty much figured out that the problem was related to one of the hosts QuickGPS uses, but changing the registry keys to a different host didn't help. I was about to give up when as a last ditch effort I decided to see if I was getting the same problem on my recently upgraded AT&T Tilt... Nope... QuickGPS worked like a charm. I then decided to copy the QuickGPS registry entries from my Tilt to the Touch Cruise to see if that would fix the problem. It did! This article was published on March 24, 2008.